When I go to Project Linus meetings, no one wears name tags and it drives me crazy! 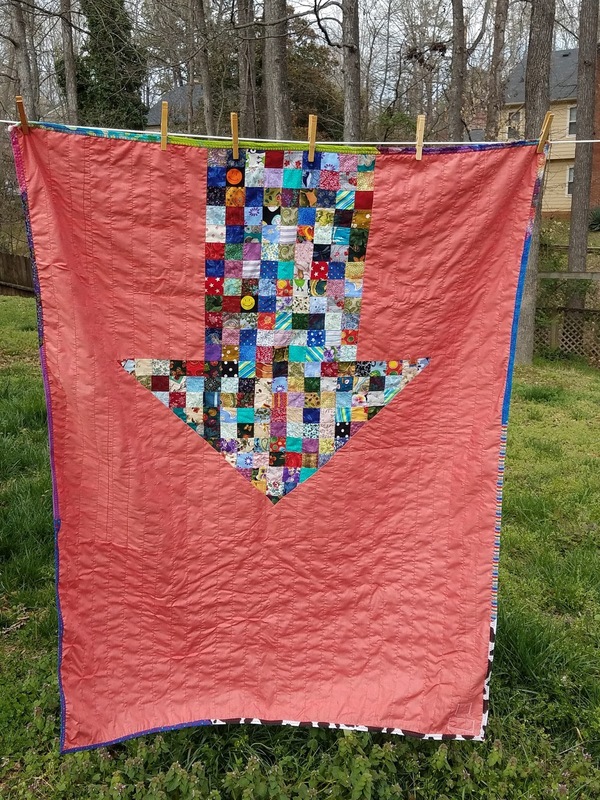 I've been wanting to make myself one for a while to wear to those meetings and other quilt related events. 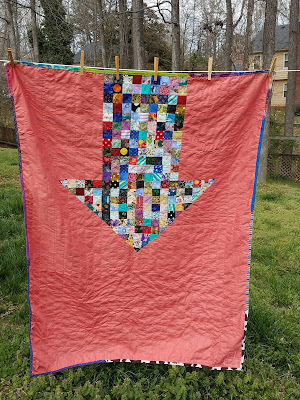 When I found out I was going to QuiltCon, it gave me the needed kick to finally do it! At some point last year, I won a scrap pack of fabric from Karen Lewis through Scraptastic Tuesday. 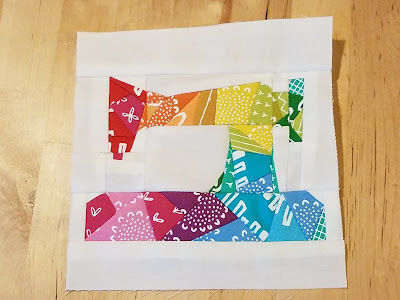 I knew that I wanted to use it to make the fabulous rainbow sewing machine designed by Kristy of Quiet Play. I bought the smaller version of her pattern and made the 6" version. And I love my finished block, but it was way to big to be a name tag. Husband to the rescue! 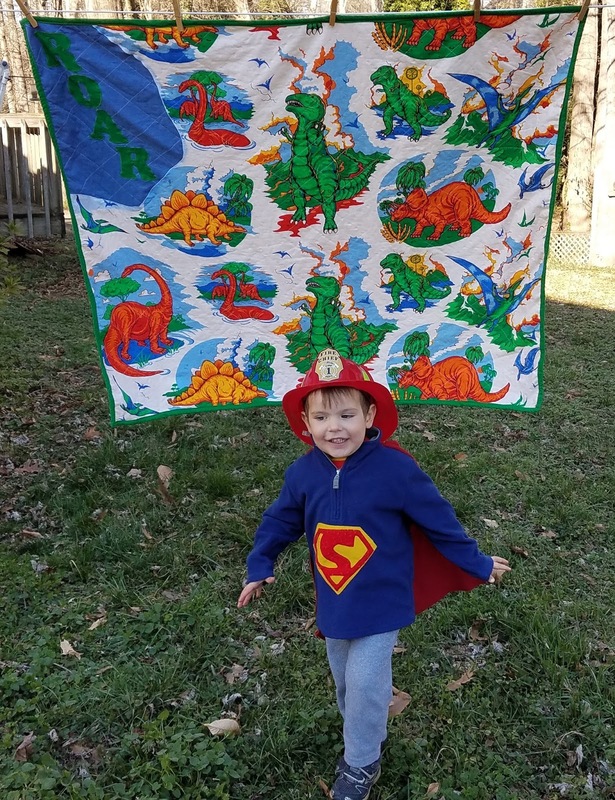 He scanned the block so I could shrink it, and then I printed it on fabric. I embroidered my name, then did a 1/2" crosshatch quilting. And I love it! At my work, we use magnetic name tags. I have a few work study students and the nature of those positions means high turnover, so I had a few name tags for students who didn't work for me any more. 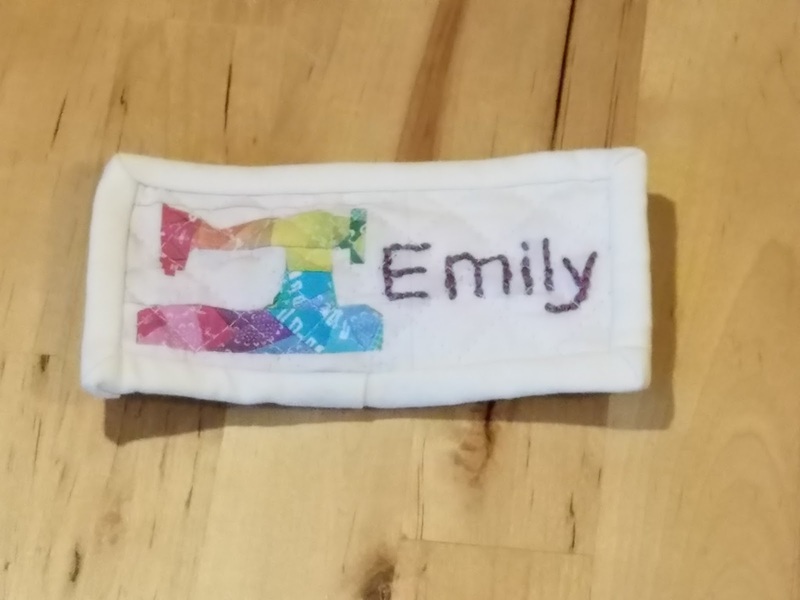 I hand sewed the name tap part to the back of my name tag so that I can use the magnetic back. At the last minute, I decided to make name tags for my QuiltCon roommates, too. None of them knew me prior to QuiltCon and they let me crash with them fairly last minute. For theirs, I printed their names instead of embroidery. Sadly, I didn't remember to take a picture. But they were a hit, and a few people at QuiltCon told me that they saw other people "from my group" because they recognized the name tag. This was goal #2 on my list of Q1 goals for the globally hosted finish along. I completed my Meadow Mystery quilt! 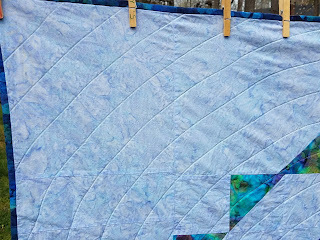 This was a mystery quilt along designed and hosted by the wonderful Cheryl of Meadow Mist Designs. I was lucky enough to meet Cheryl at QuiltCon, but I didn't think to get a picture. If you've seen other pictures of this highly popular quilt, you know that there is something missing in mine. See, I wasn't going to do this mystery quilt, because I still have only a finished top from last year's mystery. But then I went trough my stash and I found fabrics I thought would work and only needed to buy the background fabric. 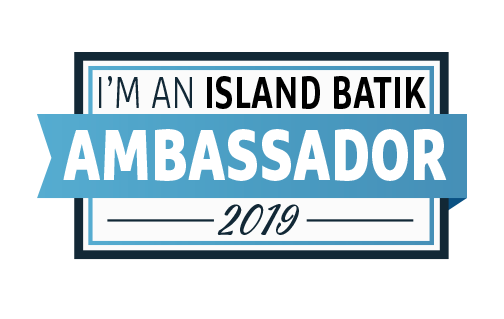 So I was in! 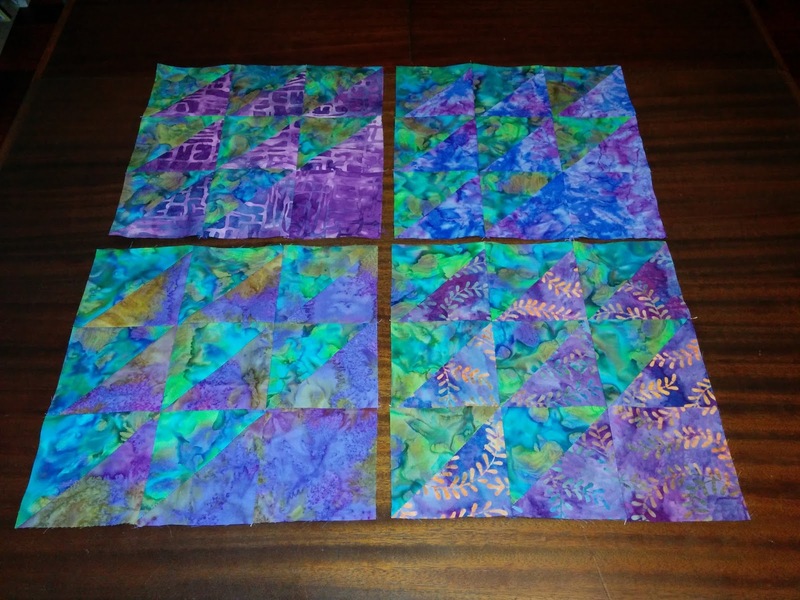 Except on the very first set of blocks assembled, my fabrics didn't have much contrast. I knew I would probably have to remake them, but not knowing the rest of the design, I waited. Yeah, that wasn't going to work. Once I was done with all the blocks and knew the layout, I went to remake the problematic blocks with a different fabric combination. But since I used stash, I had very little leftover. I played around with a few different alternative layouts, but decided that my favorite was the original pattern minus the outside part, which I am calling the secondary pattern. (It's not a secondary pattern in the traditional sense.) I had *barely* enough background to make it, but since it's a batik with a fair amount of movement, you can't tell that some of the background blocks are pieced. I wasn't sure how to quilt it until I saw Galaxy by Patty of Elm Street Quilts. 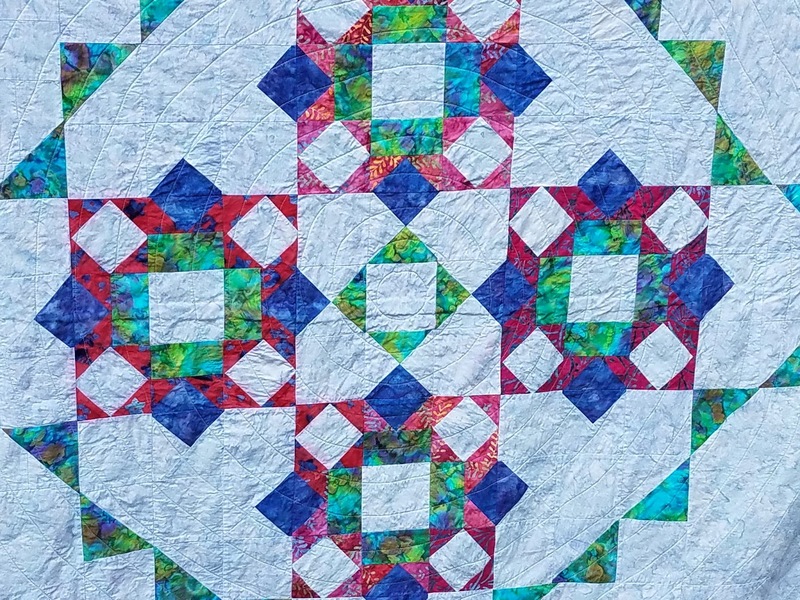 She downsized the pattern to make it smaller and quilted in a spiral. I loved it! And imitation being the sincerest form of flattery, I copied her! My spiral is not as tight as Patty's; I did a 2" interval. I'm really pleased with how it came out. 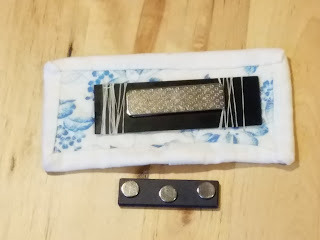 This was my very first time using Aurifil Thread. I did their puzzle game at QuiltCon and won a small spool of thread, 28 weight. I've been wanting to try Aurifil, and the color I picked out of the prize bowl matched quite well. My machine loved it, so I just might end up buying more in the future. And now I know what all the fuss was about! I didn't have enough of any of the original fabrics for binding, so I looked for a fabric to use from the vendors at QuiltCon. I chose a batik that I thought blended well; it came from Wingspan Crafts. 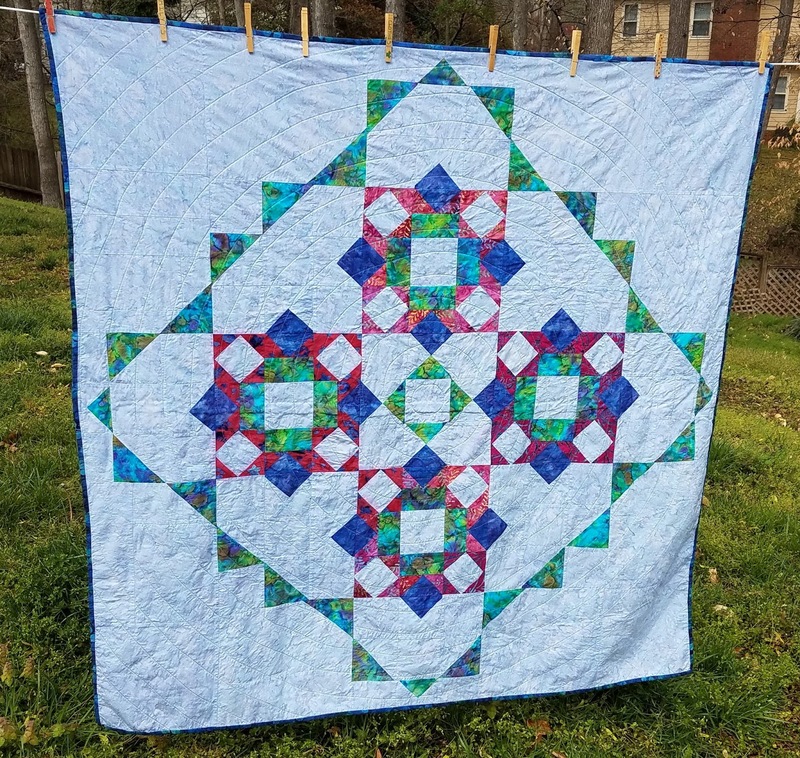 Finishing my Meadow Mystery was my March goal for OMG hosted by Patty of Elm Street Quilts--yup, same as the inspiration for the quilting! This was also goal #5 on my list of Q1 goals for the globally hosted finish along. I'm in two online quilting bees this year. In Stash Bee, it is Lori's turn to be our Queen. Lori is making an I Spy quilt for her father who has Alzheimer's. She asked for I Spy blocks, extra bonus points if the fabrics had to do with fishing. 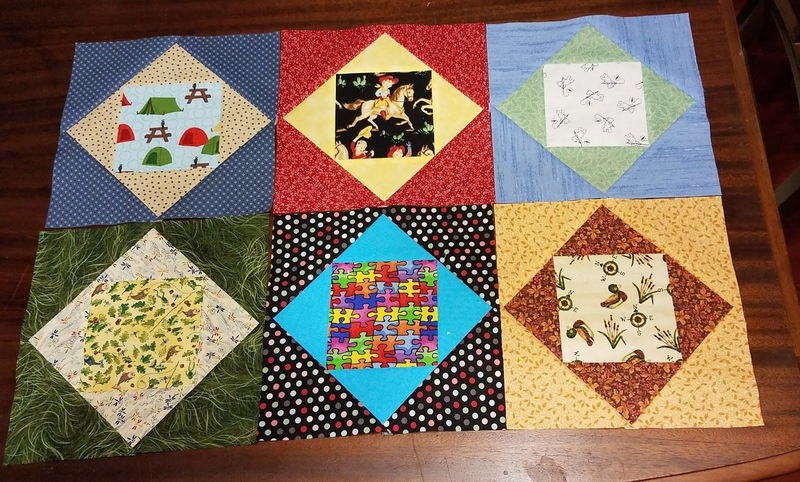 Well, novelty fabrics are of course my favorite and I have a huge stash of 5" squares from various swaps I've done. I made 6 blocks for Lori and it was hard to narrow it down to only 6! 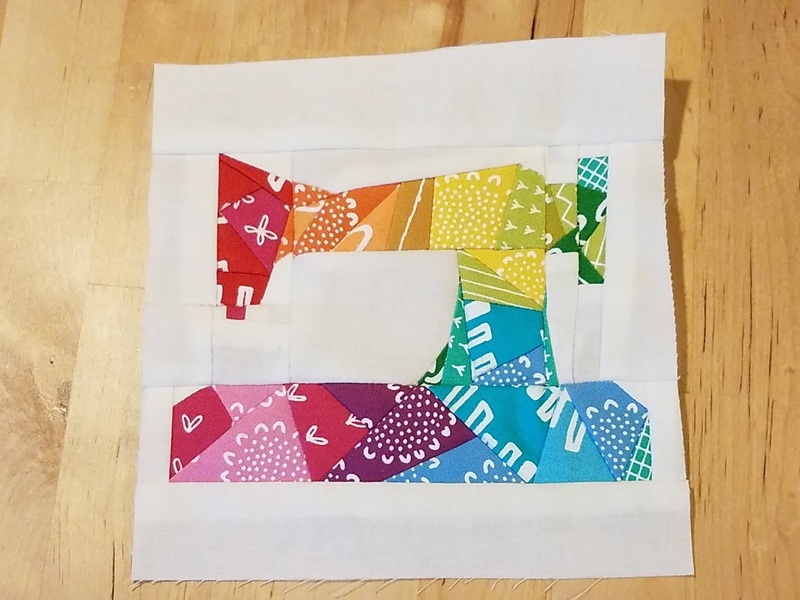 I loved this block and think I might do my own I Spy quit this way. Here's is Lori's tutorial. In Bee Inspired, it's Queen Kate's turn. 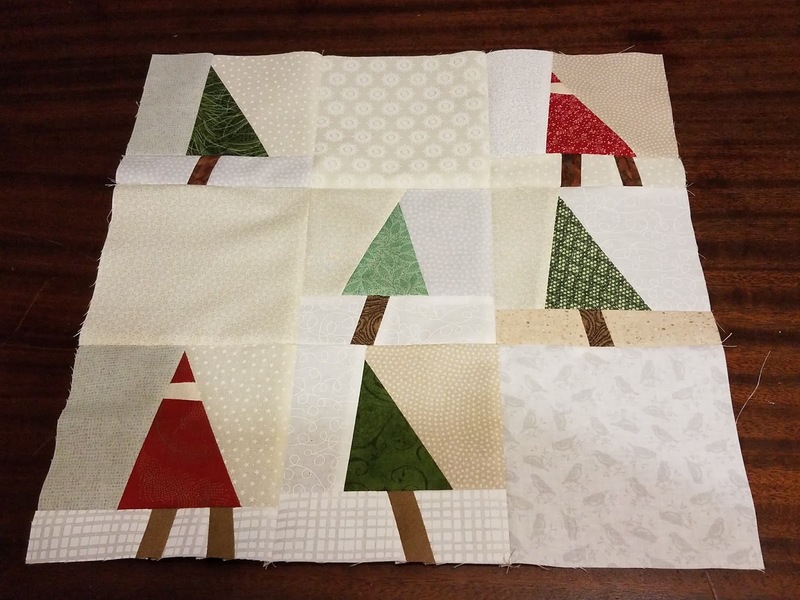 She picked a really fun trees and gnomes block, originally by Sylvia at Flying Parrot Quilts. I had a good time with this one. It calls for several background prints, and some actually looked better on the wrong side of the fabric, so I flipped a few around. Hopefully you can't tell when you look at the block! One thing I really like about these Bees is that I get to meet quilters from all over the world. This month, both of my blocks are leaving the United States. Lori is in Canada and Kate is in the UK. 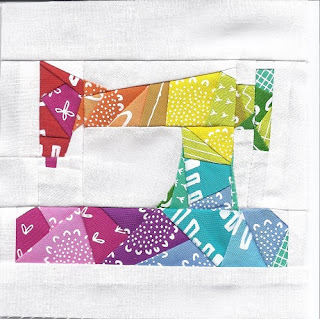 I love the Rainbow Scrap Challenge hosted by Angela of So Scrappy. This year, I picked elephant blocks. I am using both the small and the large elephants from the Elephant Parade quilt along by Lorna of Sew Fresh Quilts. 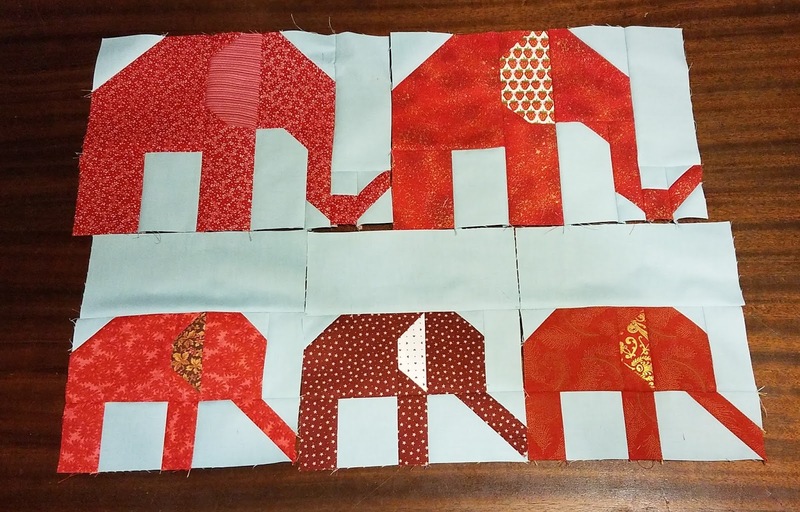 Even though the Elephant Parade quilt along was a few years ago, Lorna keeps the pattern up and available. I'm making 2 large and 3 small elephants in each color. March's color is red. Updated to include a picture after I added eyes! 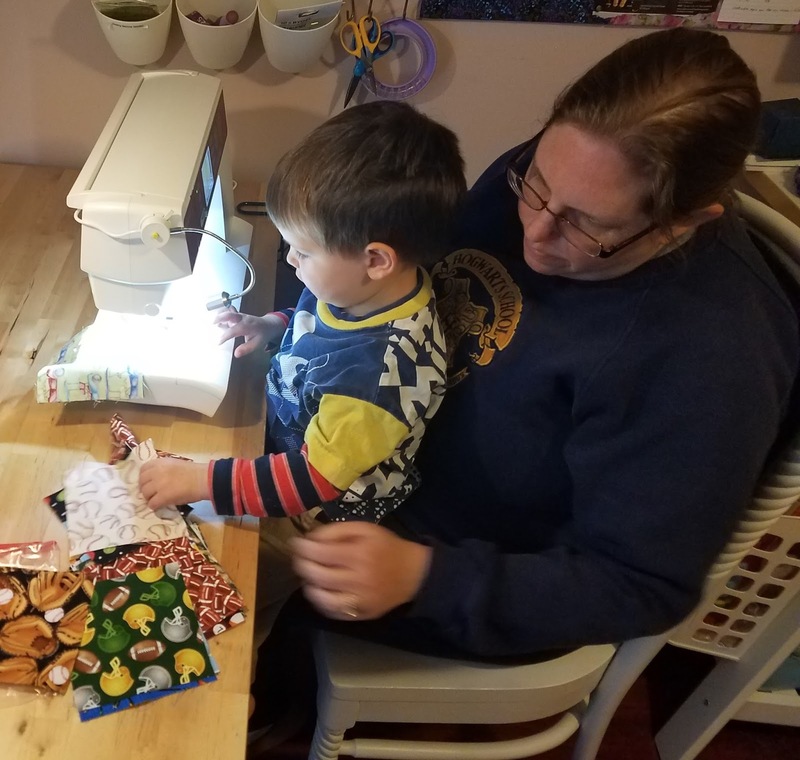 A few months ago, Munchkin happened into my sewing room while I was sewing, a rare happening. I mostly sew when he is in bed or not in the house. But this particular day, my mother-in-law was over to spend time with Munchkin prior to being gone for several months, so I was sewing and had left the door open. 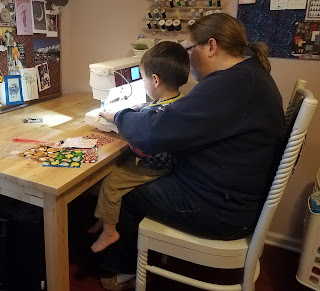 He wanted to sew with me, so I put him on lap for a few minutes and let him guide fabric. I was making binding, so it wasn't exciting. I decided to pull some I Spy fabric he would like and have them ready for next time he wanted to sew. With today being National Quilting Day, I asked if he wanted to sew with me. He did, so we sat down and matched a few sports-themed I Spy squares. He had to learn not to touch the buttons, but overall, the session was a success! He got to pick out of the pile next to the machine as we paired them up. We have a way to go, as he can really only concentrate for about 15 minutes, but that's a good start! This is one of those long-term UFOs. I'm not sure exactly how long I've had this large scale dinosaur print, but it's been a while. I'm thrilled to say it is finally finished! The public library where I used to work had a bin where people could donate and take craft supplies. 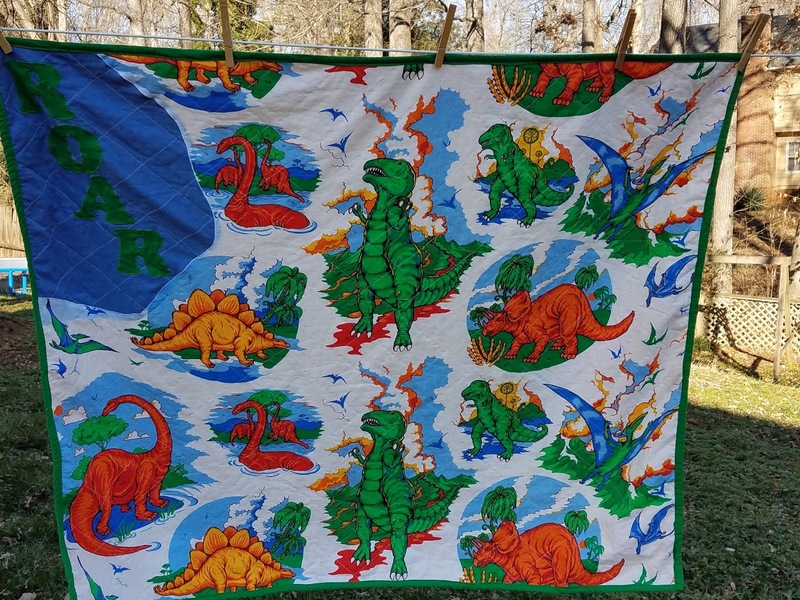 At one point, I found this really colorful dinosaur fabric. 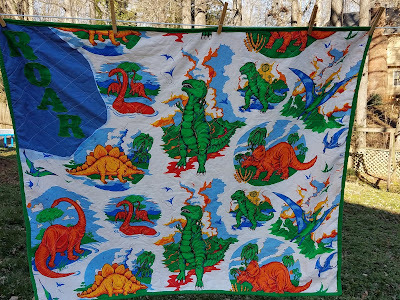 There was a somewhat odd-shaped piece cut out, and I'm guessing whoever had it originally cut out a dinosaur for applique. 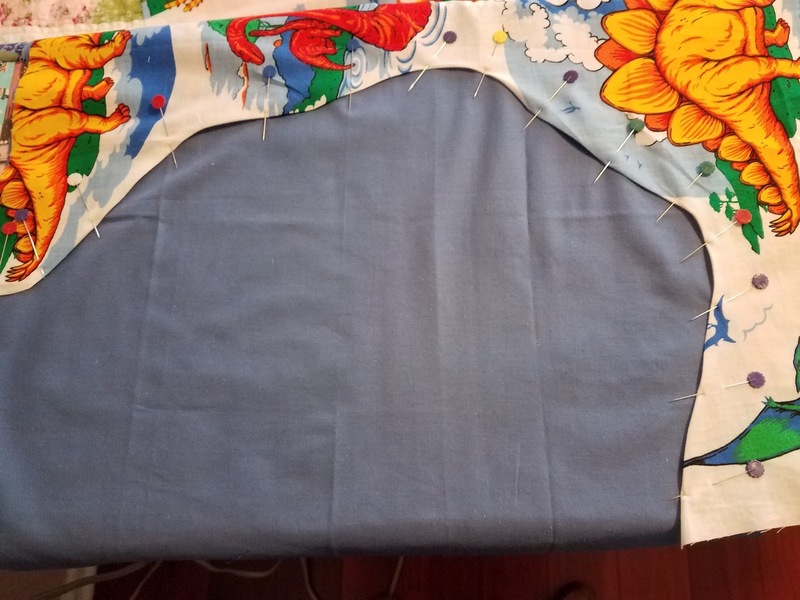 I looked through my stash and found a fat quarter of blue fabric that would work. 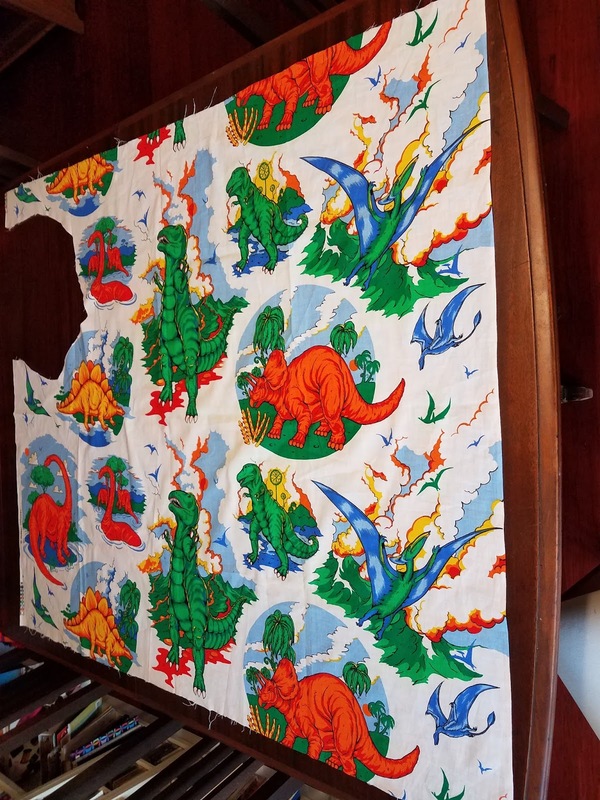 I pinned them together with the dinosaurs on top. Then I used a satin stitch around the edge to secure it. 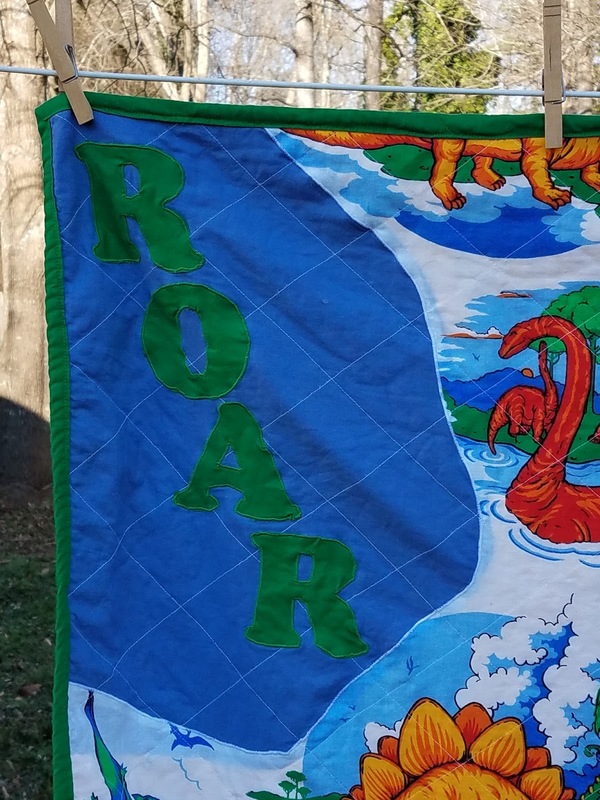 I quilted with a diagonal grid, then used my Accuquilt to cut out letters saying ROAR to put in this odd space.The green is some left over Kona Clover, also used for binding. When Munchkin saw me working on this one, he really liked it. 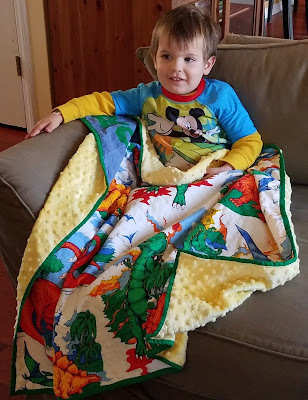 His current favorite blanket is a fleece duck blanket that he was given as a baby present, and as much as I don't like to admit it, I don't like the fact that he likes a bought blanket more than a hand made one. I've been wanting to make him one with fleece on the back so it will be cuddly. I had some yellow textured minky that my friend Snow gave me when she de-stashed recently, and since yellow seems to be one of his current favorite colors, I figured that would work. I've had this on my FAL list of goals since I first discovered the FAL in January 2015! I'm really pleased to have finally finished it, and it's a bonus that my son wanted it as his. This was #14 on my list of Q1 goals for the globally hosted Finish Along. My very first leader & ender project was an adaptation of this pattern. The original pattern was meant for a mini charm pack, or 2 1/2" squares. I wanted to use up some 2" square scraps, so I did the math to figure out the length & width of the arrow shaft & head, then figured out how many 2" squares I would need for the same dimensions. It's still in 2 pieces here, you just can't tell from the angle. 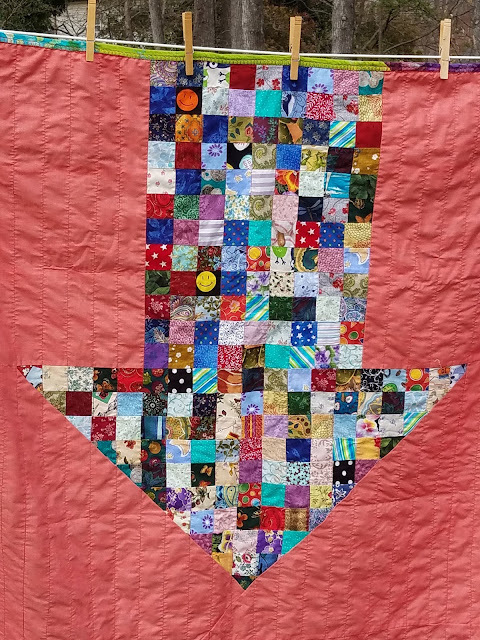 I've had the arrow done for close to a year, but since completing it involved figuring out angled piecing, it's been in a drawer for quite a while. But now it's done! The solid was from a 4 yard cut that was in a box of fabric my grandmother gave me several years ago. There are 208 squares: 100 in the arrow head and 108 in the shaft. 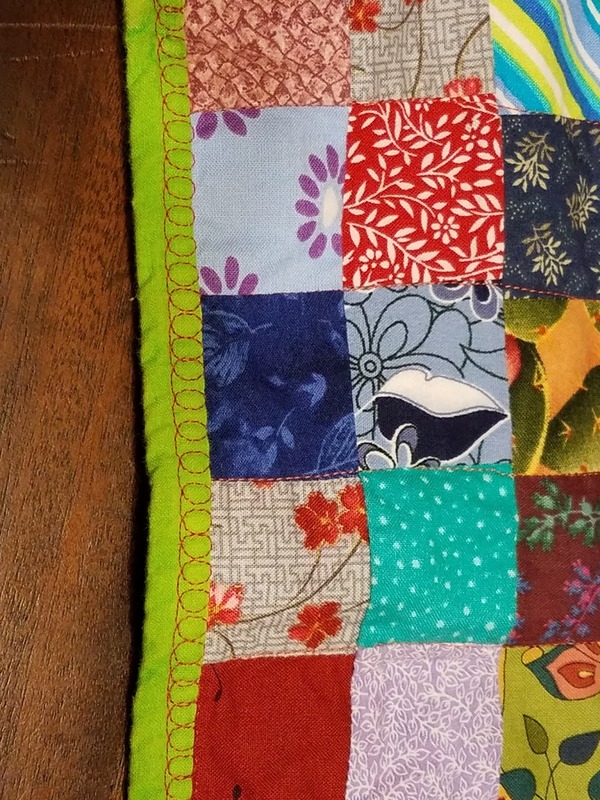 It's not an I Spy quilt strictly speaking, but a fair number of the scraps do have objects in them. I thought this would be a good project for scrappy binding, so there are 7 different pieces of leftover binding in this--hooray! 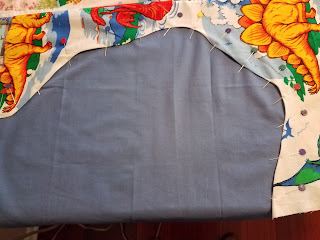 The back is a large piece of minky fabric that was donated to my Project Linus chapter. Though my preference is to hand stitch binding, I don't like to when the back is minky, so I machine sewed the binding. I used a decorative stitch, though I'm not sure I like it. Aesthetically it looks fine but it's so much thread that it makes the edges feel stiff to me and I don't really like that. But overall, I'm quite pleased with it. This was #15 on my list of Q1 goals for the globally hosted finish along. 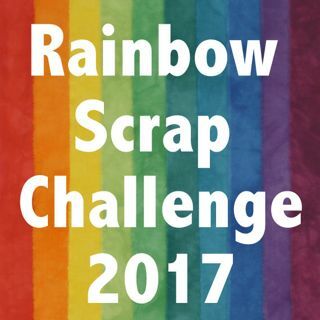 I will be linking up with Oh Scrap! 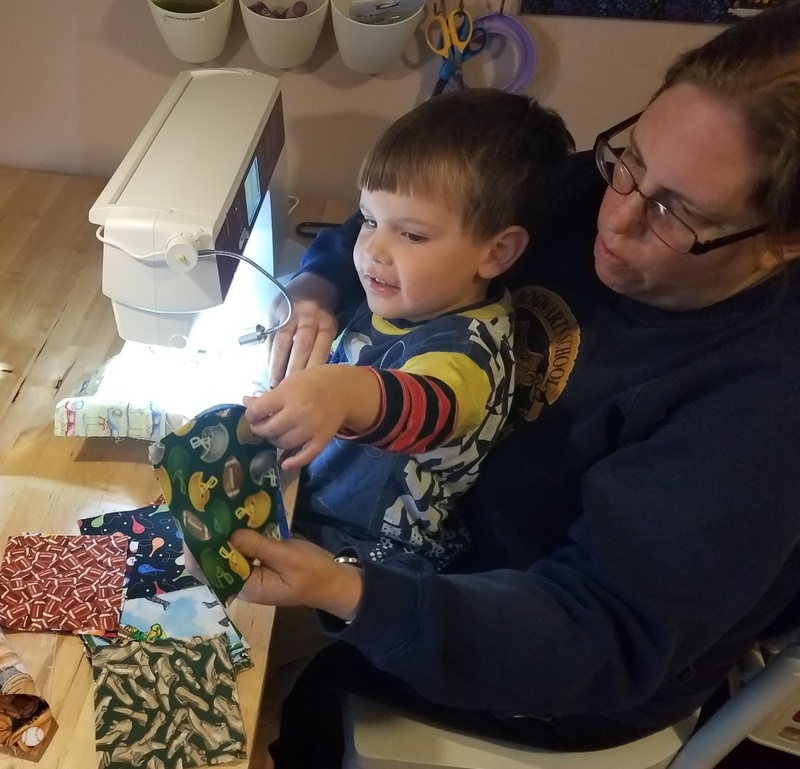 hosted by Cynthia of Quilting is More Fun Than Housework, and with Scraptastic Tuesday co-hosted by She Can Quilt and Mrs. Sew & Sow. (I'm having trouble with that button, so my apologies for it not appearing. 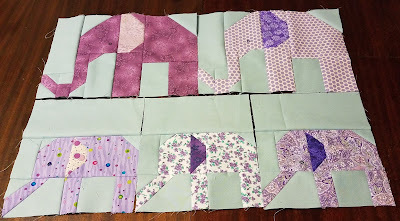 For this year's Rainbow Scrap Challenge, I picked blocks from Elephant Parade by Lorna of Sew Fresh Quilts. Elephant Parade was a quilt along that Lorna did a few years ago and she continues to keep the pattern available. 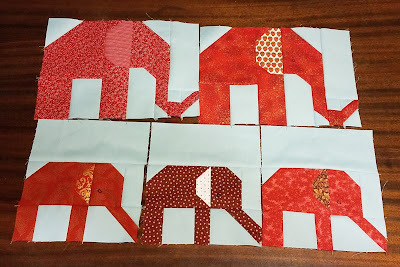 I am using the small and large elephant blocks. I've decided each color will have 2 large and 3 small elephants. 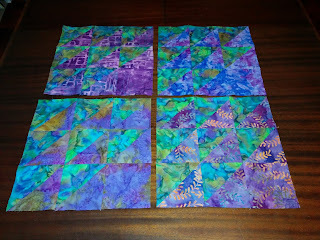 I planned all along to do two quilts for the Rainbow Scrap Challenge. 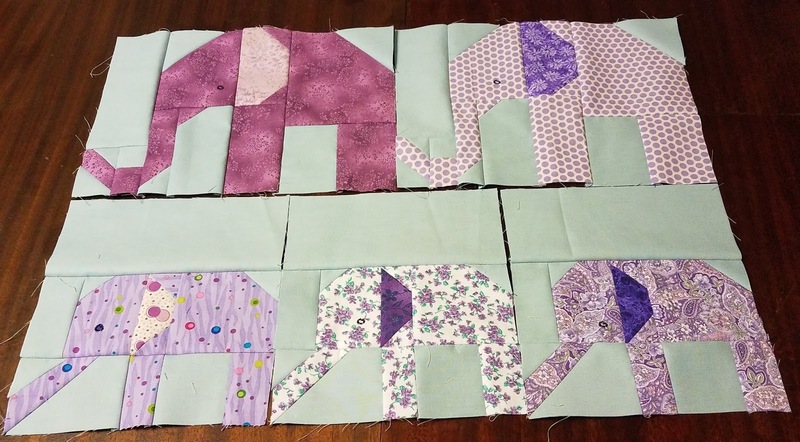 I'm thinking about doing the elephants for the colors in the rainbow and picking a different block for the neutral colors. I'm currently debating between the salmon and the hen, both individual blocks by Lorna and for sale in her Etsy shop. But neutral colors haven't come up yet, so I still have time to decide. Purple was January's color. I've had these done for a while but didn't get the post written up. February's color was aqua, which I skipped since I don't have enough to warrant using aqua independent of blue. March is red and I cut out all my elephants last night, just need to get them pieced. For March, I want to finish my Meadow Mystery. Finishing the entire quilt is a bit ambitions, but I'm going to go for it. I do not have my top together yet, and I need to make a couple blocks before I can assemble the top. Some of my blocks don't have enough contrast to work, and since I was using up stash, I don't have extra to re-do those. So I'm going for a simpler design instead. Linking up with Elm Street Quilts for One Monthly Goal.